In the history of world film, 1953 was an exceptionally fruitful year. In Italy, Federico Fellini introduced his semi-autobiographical hero Moraldo to the world in I Vitelloni (1). In Sweden, Ingmar Bergman nailed his reputation as a filmmaker of genius with his first great film, Sawdust and Tinsel. In Japan alone two of its greatest film artists created masterpieces: Yasujiro Ozu’s Tokyo Story was released, a film that has turned up on Ten Best lists ever since (at least since foreign distributors finally decided that it be shown in the West); and Kenji Mizoguchi’s Ugetsu Monogatari was immediately hailed as one of the most beguiling films ever made, whetting Western audiences’ appetite for Eastern exoticism – something that had been created by Kurosawa’s Rashomon (1950) and considerably expanded by Teinosuke Kinugasa’s Gate of Hell, also released in 1953, and shot in glorious Agfacolor. Mizoguchi’s film was in black-and-white but had the advantage of being billed as a ghost story. As audiences quickly discovered, however, Ugetsu Monogatari is a peculiarly Japanese ghost story. In the 16th century, a time of civil wars, Genjiro (Masayuki Mori), lives with his wife Miyagi (Kinuyo Tanaka) and young son while plying his trade as a potter. Though poor, he talks incessantly of bettering his lot by selling all his wares in town at a great profit, and his brother Tobei (Eitaro Ozawa) boasts of buying a suit of armour and becoming a samurai. Their wives tell them to be thankful for what they have instead of wasting their time on such dreams. Very quickly the film has introduced us to one of the central themes of Japanese film: the resigned acceptance of the way things are rather than an insistence on change and resistance to the status quo. While Kurosawa was often on the side of the latter, showing how diligence can sometimes create incremental change (in Ikiru, 1952, and Red Beard, 1965), Mizoguchi, a traditionalist, is always on the side of the former, since it is the only way to attain serenity – what has come to be known as mono no aware (2). But of course, Mizoguchi must allow Genjiro to learn this for himself, at great cost to those he loves most. Just as the script for Rashomon was derived from two different stories by Akutagawa, the script for Ugetsu is based on two stories by the 18th century writer Akinari Ueda, from his collection Ugetsu Monogatari (Tales of the Moon and Rain). Mizoguchi combined the stories merely by making the protagonists of the two tales brothers. In the tales and in the film, they both realise their ambitions – Genjiro finds wealth beyond his wildest dreams in Lady Wakasa’s mansion and Tobei becomes a samurai with his own horse and men under his command. Although two ghosts are introduced as principal characters (3), neither is malevolent (even if, admittedly, one of them tries to make Genjiro hers for eternity). Nor are they your typical movie ghosts – created through double exposure or other special effects. Mizoguchi and his cinematographer, the irreplaceable Kazuo Miyagawa, use only shadow and light to evoke the unforgettable illusion of Genjiro’s idyll with Lady Wakasa. The film abounds in extraordinary sequences. The long crane shot at the film’s opening, establishing the setting of Genjiro’s hut. The beautiful little scene in the town where Genjiro stops to admire kimonos and imagines seeing Miyagi touching them and trying them on. The interiors extravagantly materialise around Genjiro as he enters the mansion and candles are lit from room to room. The justly celebrated love scene by the shimmering lake. Mizoguchi’s realism is painstaking in its straightforwardness. All of his great period films – The Life of Oharu (1952), Chikamatsu Monogatari (1954), and Sansho Dayu (1954) – deal with ordinary human beings facing real problems, usually highlighting the disadvantaged position of women. If Mizoguchi had a point to his concentration on women, it may have been to explore how their subjugation ultimately affects everyone, male or female. When Tobei discovers his wife has been forced into prostitution, he knows that he is ruined as well, despite his samurai title. Ugetsu Monogatari is, as Vernon Young noted in another context, “a noteworthy essay on the saddest subject there is: illumination glimpsed too late” (4). 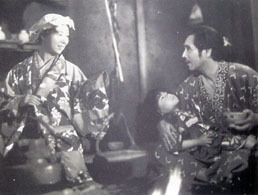 Typical of Mizoguchi films, the best performances belong to women: Kinuyo Tanaka’s long-suffering Miyagi, whose patience is rewarded only after her apotheosis; Mitsuko Mito’s playing of Tobei’s wife, who teaches him that position and respectability come with a heavy price; Machiko Kyo’s perfectly realised portrayal of a young woman utterly, distractedly devoted to love and the happiness it gives her. But there is also her startling look of terror and sadness when she finds the Sanskrit prayers written on Genjiro’s skin. And then there is the long closing sequence, exploiting Mizoguchi’s love for long takes, as Genjiro returns home. The wisdom he has attained allows him even to accept the great loss he discovers in his hut, and the presence of a love so obstinate that it could not be taken away. Fellini’s original script for La Dolce Vita (1960) was called Moraldo in Citta. Donald Richie defines mono no aware as “that awareness of the transience of all earthly things, the knowledge that it is, perhaps fortunately, impossible to do anything about it: that celebration of resignation in the face of things as they are.” Japanese Cinema: Film Style and National Character, Anchor Books, New York, 1971, p. 77. There are possibly as many as four other ghosts in the film. There is the voice of Lady Wakasa’s dead father which is heard coming from his enshrined suit of armor. The other three are uncertain: Lady Wakasa’s maid and two other attendants in her mansion. All three, however, vanish with Lady Wakasa, leaving her deserted mansion in ruins. Vernon Young, On Film: Unpopular Essays on a Popular Art, Quadrangle Books, Chicago, 1972, p. 226. Dan Harper is an America writer, traveller, blogger and cinephile who lives in the Philippines.